July 17, 2014, Prof. Antony Patrick Selvadurai, academicians of Canadian Academy of Sciences and Engineering and his team started a 3-days visiting to Jereh, deepening mutual R&D cooperation on the field of rock and soil mechanics and polymer composites. As the pioneer and founder of international Rock and Soil Mechanics and the academician of UK Royal Science .Prof. Selvadurai has taken part in more than 300 research projects and enacted 70 international standards. It is well known that he has win Max Planck Prize, Nobel Prize in engineering field. As one of ”Top 50 Most Innovative Enterprises”, Jereh attaches great importance to bringin industry talents and conduct international R&D cooperation. By now, there are 259 national patents and more than 1,000 professional engineers in three global R&D centers of Yantai headquarters,, Houston and Calgary. 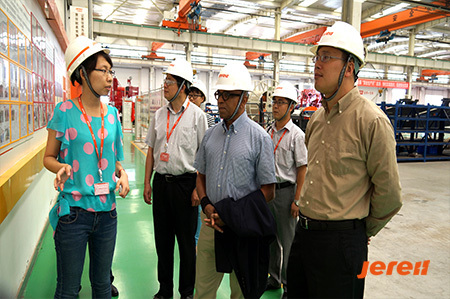 Besides, Jereh has established 18 energy technology institutes and 9 O&G application labs at home and abroad, solving the industry challenges.